This is the longest post yet at Land of the Dead but please persevere constant reader. Many people went through a great deal of time and effort in finding these fossils, even if the discoveries were all accidental. Holes are odd things. They aren’t so much something as something not -- a space or hollow in a solid object. Something was removed or is missing to make the hole. Going down a rabbit hole, as in Alice in Wonderland, has become a metaphor for exploring a new world or delving into the unknown. The Acme Hole Company, made famous in the Warner Brothers’ coyote and roadrunner cartoons, manufactures portable holes that can be carried and placed anywhere. Fall into an astronomical black hole and you’ll eventually be drawn out until you are nothing more than separate subatomic particles. And, of course, we all know people who are holes of one sort or another. In past Land of the Dead posts we’ve looked at mining operations that have accidentally turned up important fossils, treasures that would otherwise have remained forever hidden from scientists. Today we’ll look at another case of vertebrate fossils turning up deep in the crust --- fossils found while drilling boreholes. In the modern world drilling rigs put deep holes in the earth’s crust in the search for water, petroleum, natural gas, etc. 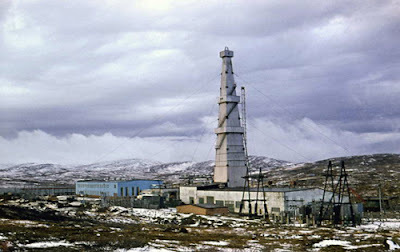 These rigs can drill to tremendous depths, the SG-3 hole of Sakhalin-I Odoptu OP-11 Well in Russia reached a depth of 40,502 ft (12,345 meters)! The drilling went on for 24 years, halting in 1997. 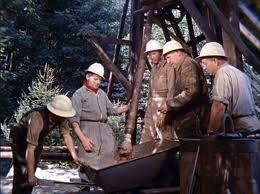 But deep drilling has a surprisingly long history. Drilling for salt brine in the Zigong region of Sichuan, China has a long history extending back 2,000 years. Using a drill system composed of metal rods, and bamboo piping, and powered by human and animal means, they reached depths of 2000 feet (600 meters). The Sakhalin-I Odoptu OP-11 Well. Drilling is not done with drill bits like those you use to drill a hole in a piece of wood. The geologists need to see the kinds of rocks being drilled through to identify the age of the rocks, rock type, and the petroleum producing layers. So the drill bits used are cylindrical and carve long cores of rock and sediment that are brought up the shaft for examination. These cores are not thrown away, but permanently stored in vast “core libraries” and can be studied many years later. In one example we’ll look at from the Permian of Oman, the fossils were found by someone re-examining cores 20 years after they were collected. 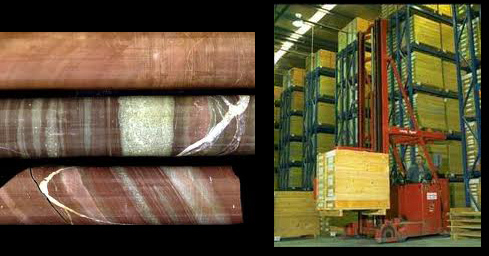 Samples from a core (left) and tens of thousands of feet of cores in a core library (right). Finding fossil pollen and small invertebrate fossils in cores is not uncommon. 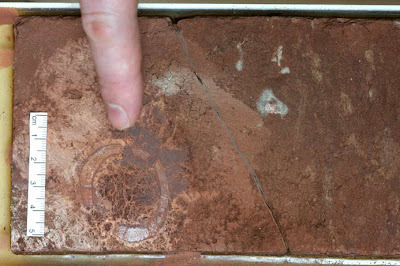 In fact, it is those very fossils that geologists look for in the cores to understand the age of the rocks they are drilling to and determine when the sought after layer has been reached and drilling can be ended. In contrast to pollen and invertebrates, vertebrate fossils are orders of magnitude rarer. Of all the members of any species of vertebrate that lived, only a miniscule, and sometime not even one, became fossilized. And of those that became fossils, many were destroyed by later geological activity. Of those remaining, many were exposed on the surface of the earth many, even hundreds of millions, of years ago and were destroyed by weathering and erosion. It's only those fossils exposed on the surface over the last few hundreds of years, and exposed in areas where scientists were able to get to, that constitute the great paleontological collections held in our museums and other institutions. However, there remain untold numbers of vertebrate fossils still buried, below the surface, in the our planet's rocky crust --- sometimes many thousands of feet below the surface. As inaccessible as those buried fossils are and as unexpected as it might be, the narrow diameter cores sometimes remarkably, against all odds, contain vertebrate fossils. These are fossils that would otherwise never have been found. The cores are not wide, maybe 6 inches on average and vertebrate fossils are often scattered and isolated, so the chance of hitting one, essentially by accident, would seem to be infinitesimally small. But not as small as one might think. So what are some of the discoveries made by this most unusual method? That’s what we’ll explore here. A bit of explanation of what is in this compilation seems needed. The list includes larger fossil vertebrate remains that have been found in cores and have been reported in the scientific literature. Given the extremely scattered nature of this literature, I would not be surprised to find that there are published reports which I have missed. However, I believe I have covered all the major discoveries. For each record I have reproduced an image of the specimen (if single) or a representative fossil if many fossils were present. For a few records no images were published or available. I have also included an image of a representative of the group the borehole fossil belongs to, to give an idea of the living organisms. In a few cases the borehole fossil was complete enough that such an ancillary illustration was unnecessary. The scientific name and age of occurrence are as reported in the original paper. I have not tried to update either, although I have noted subsequent papers on the fossils where I am aware of them. I am aware of fossil vertebrate remains found in cores that have not appeared in print and have left them out. I have not included fossils found while digging wells, such as the type of the sauropod dinosaur Neosaurus missouriensis (Gilmore and Stewart 1945). 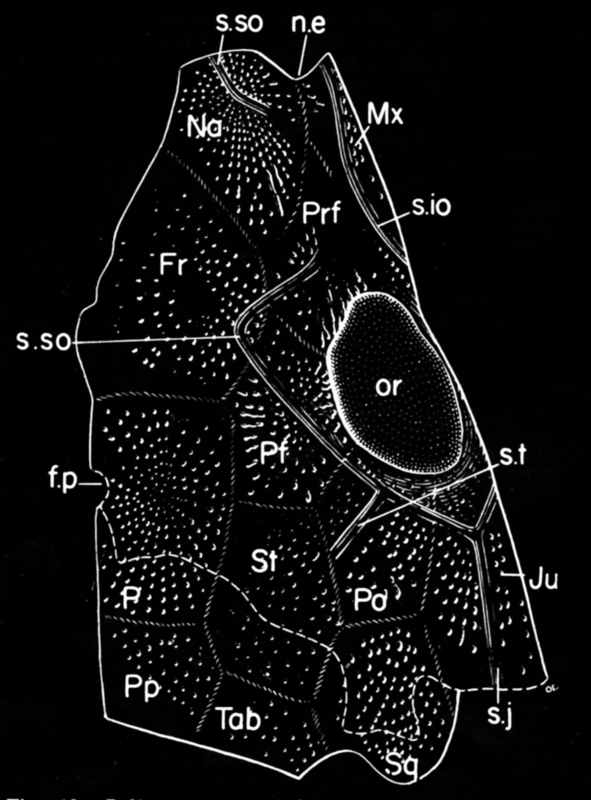 I have also excluded ichthyoliths, which are isolated small teeth, scales, spines, etc. found in cores of deep sea sediments such as those done across the world’s oceans during the Deep sea Drilling Project. There are many publications on ichthyoliths but including them here would greatly increase the length of this list without adding much significant additional information. I have included one ichthyolith based publication as an example of that type of research. I have also excluded conodonts, jaw-like microfossils that are sometimes, but not always, considered to be vertebrates. The literature on conodonts runs to thousands of papers and cannot be accommodated here. With all that out of the way, let’s proceed. I have arranged the occurrences by increasing depth of discovery so those of you who are impatient and simply can’t wait, well just jump to the end. But you’ll ruin the suspense. Actual fossil reindeer print (right) and interpretive drawing of track (right). Well: Core was taken through soft Late Glacial through Holocene lake deposits in Denmark. 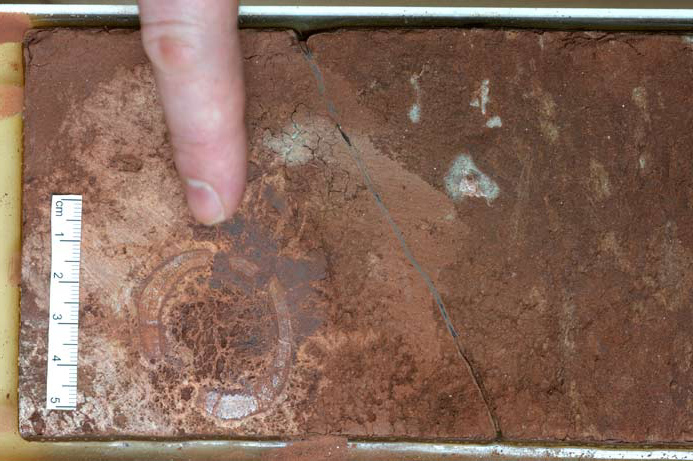 Comment: This is the first vertebrate track ever discovered in a soft sediment drill core. 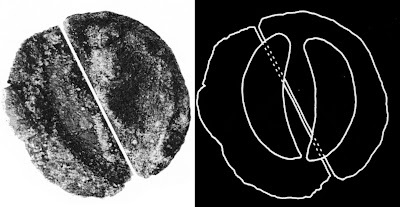 Acanthodian fossils in core (left) and explanatory drawing (right). 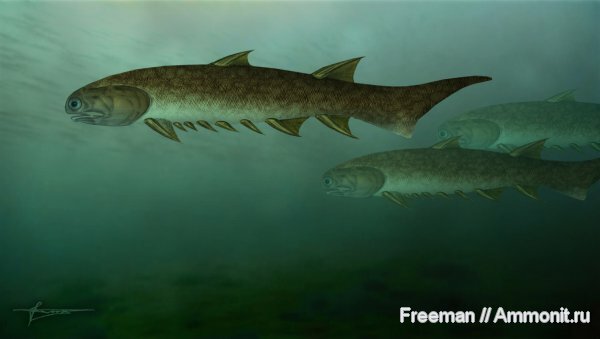 Life restoration of an acanthodian. Comment: A single core through the fossilized lake sediments at Messel Germany recovered abundant fish and rare mammal coprolites from 4.9 m to 132.3 m. The fish coprolites contained the remains of aquatic invertebrates such as cladocerans and especially abundant midges. Data from this work was used to reconstruct food webs in the ancient lake and elucidate the evolution of the lake through time. Incomplete upper arm bone of dolphin. 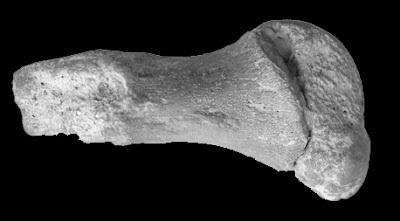 Material: Part of the humerus and a small rib fragment. Comment: This is the only record of a marine mammal from a borehole. Prothryptacodon albertensis jaw from core (top) and restoration of an arctocyonid mammal. Material: Incomplete right mandible with teeth. Comment: This is the first known specimen of the species. Latviacanthus in core (left) and drawing of jaws showing teeth (right). Life restoration of Euthacanthus, a close relative of Latviacanthus. Comment: This is the first and only known specimen of this genus and species. Fossil tracks from boreholes. A. Rhynchosauroides. B. Hamatopus. C. Procolophonipus. D.Aetosauroides. E. Coelurosaurichnus. 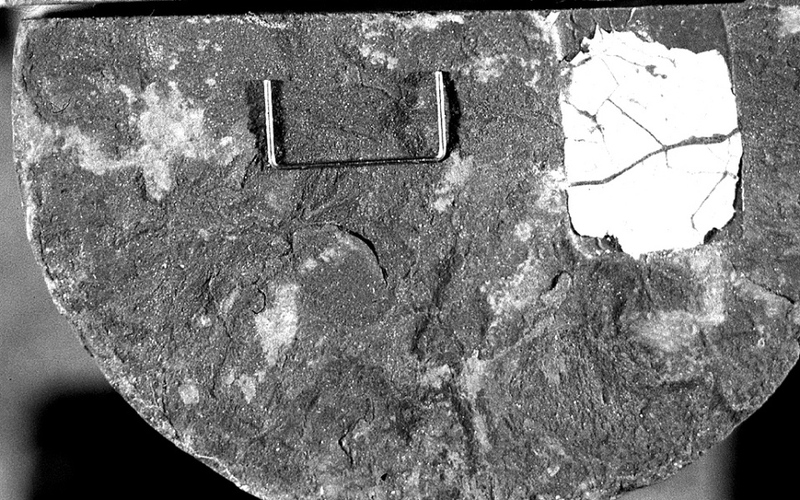 Comment: These fossil footprints were found at several levels in 3 closely spaced boreholes. For the sake of simplicity I have treated them collectively. The borehole was large, about 18 inches in diameter. There has been some dispute about these tracks; the correct scientific names for them, whether some might have been made by invertebrates, and whether some might not even be biological in origin (King and Benton 1996, Lockley and Meyer 2000, Thulborn 1990, 2006). 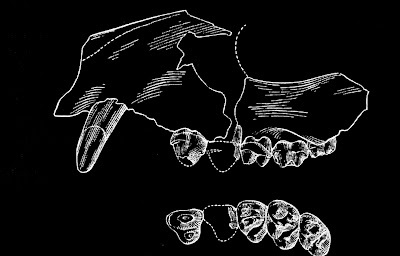 Grangerimus jaw with teeth from core. Comment: This is the first known specimen of this species. Aetosaurus scute (white square) in core with staple for scale. Colymbus parvus lower leg bone from core. 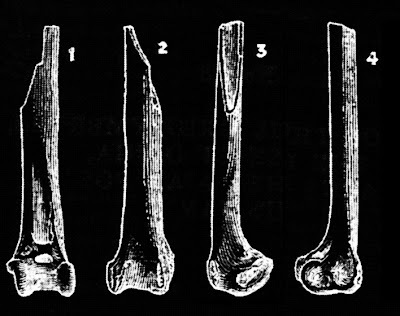 Material: Incomplete part of lower leg (tibio-tarsus). Comment: At the time of its discovery, this was only the second known specimen of this small grebe. Anisonchus fortunatus upper jaw with teeth from core. Material: Partial skull. This is the first specimen discovered of this species. The species epithet fortunatus is in reference to it being found in a well core. Even more remarkable is that the fact that this specimen did not come up in a core sample. Deep in the drill hole the drill-stem had separated from the pipe. Equipment was lowered down into the hole to retrieve the drill stem and that retrieval equipment tore out pieces from the wall of the already existing hole. When the drill stem was pulled up the hole it brought up a piece of shale with concretions up with it. 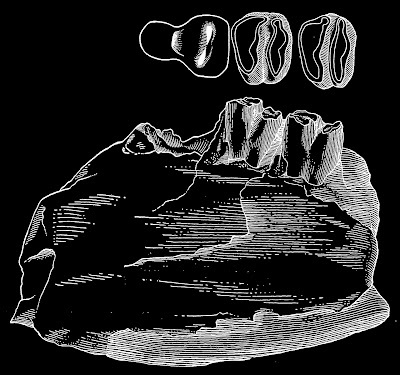 One of the concretions contained the partial skull of Anisonchus fotunatus. Preserved portions of Polysphenodon shown in solid white, with restoration of curved position of skeleton hit by core. Material: Most of a skull, left arm and hand, left leg and foot, and part of tail. Reference: Jaekel 1911, Fraser and Benton 1989. Comment: This is the only known specimen of this genus and species. The original is now missing, but casts of the original are available for study. 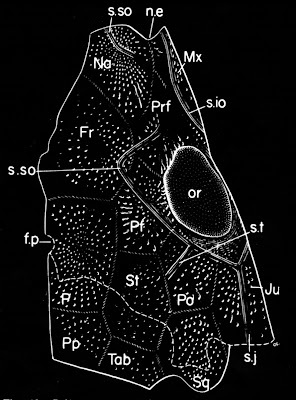 Top of right side of Deltasaurus skull from core, snout towards top, "or" is opening for eye. Comment: This specimen is the first and only known specimen of this species. Mormopterus nonghenens teeth from core. Material: More than 100 mammal jaws and teeth were recovered from the core. Catalog numbers: Because of the large numbers of specimens many catalog numbers have been assigned. Details are given in Legendre et al. 1988). 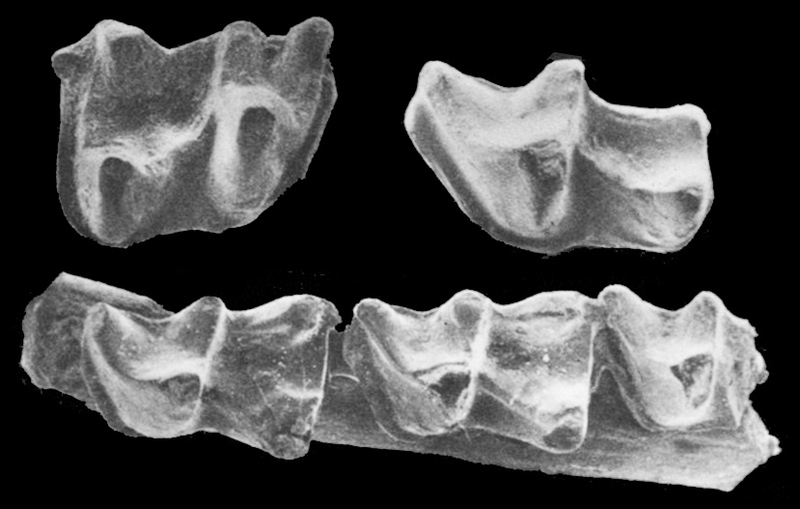 A left upper molar (TF 1878) is the type specimen of the new species of bat, M. nonghenensis. Well: Nong Hen-1(A) (NHN-1), Thai Shell Petroleum Company, northern Central Plains of Thailand. Comment: The fauna is dominated by bats. This is explained by the fact that the cores were drilled in karst topography which contains many buried and fossilized cave systems. 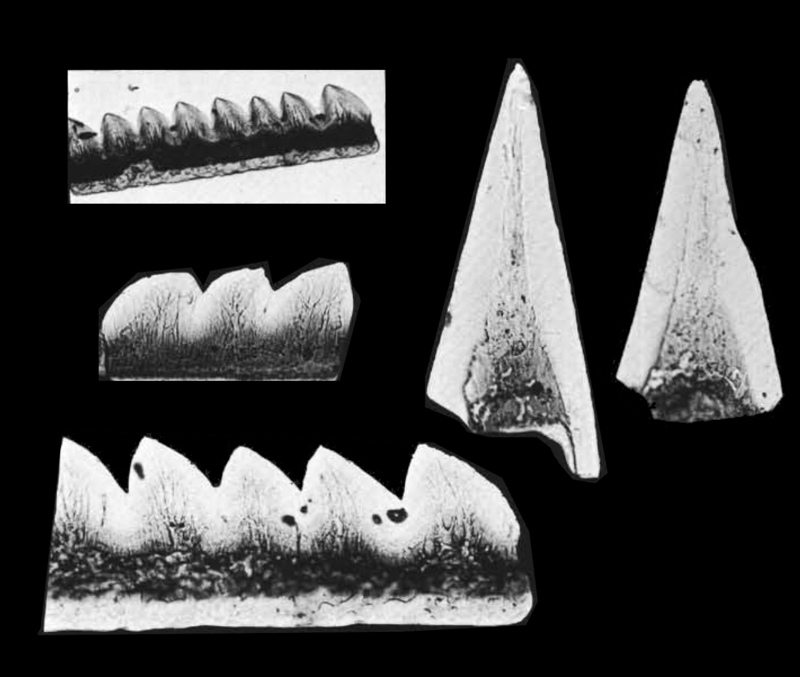 Various fish teeth from DSDP core. Catalog number: Large number of specimens from closely spaced samples. Well: Deep Sea Drilling Project Site 603, North Atlantic. Comment: Here the abundant but isolated fish teeth were used to constrain the date of an important reflector horizon within sediments on the seafloor. 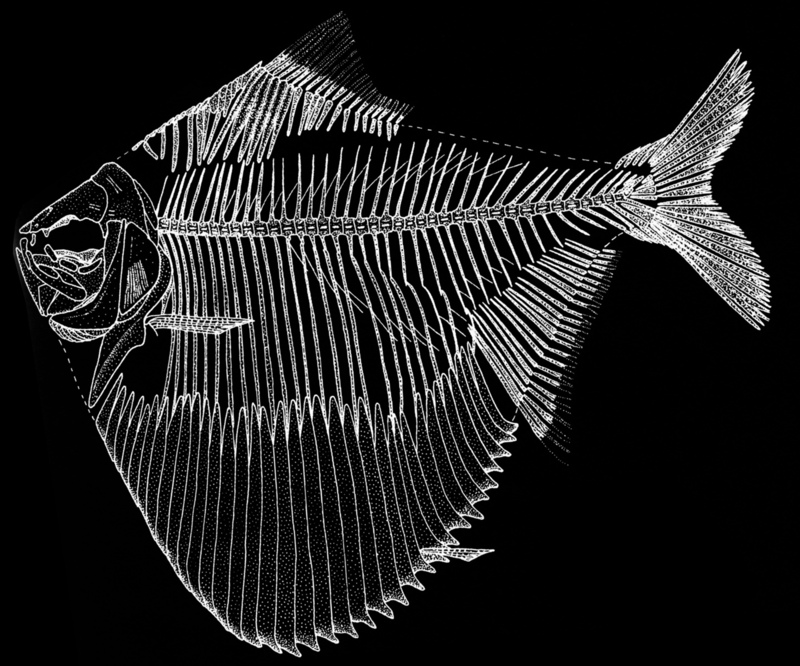 Eorubeta nevadensis skeleton from core, enhanced by UV light. Comment: AMNH 7702 is the type specimen for this genus and species. 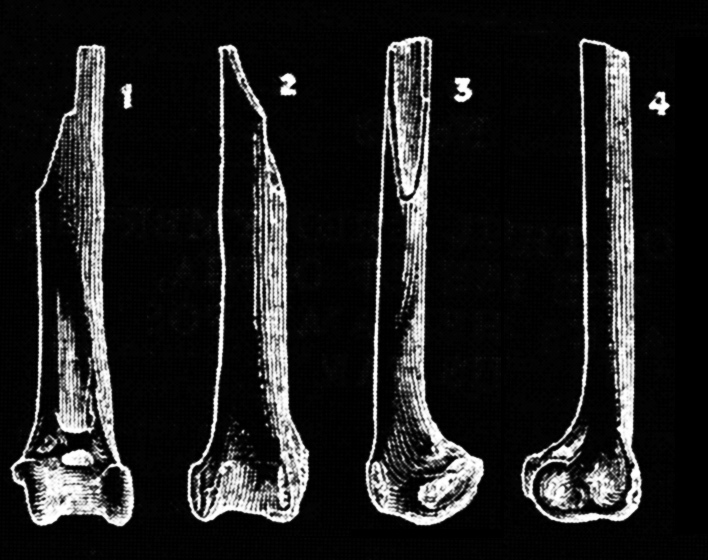 The bone was very difficult to study. It was photographed under ultraviolet light in order to make the bones much easier to see and interpret. Frog skeletons as complete as this borehole specimen are very rare in the fossil record. 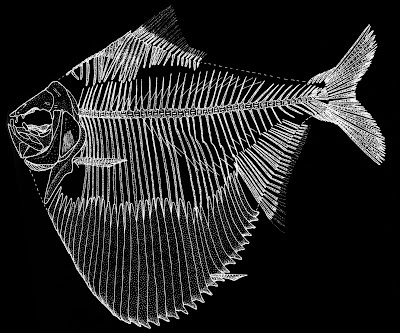 Drawing of the spectacularly complete skeleton of Tycheroichthys dunveganensis as found in the core. Material: Complete skeleton. This is the only known specimen of this genus and species. 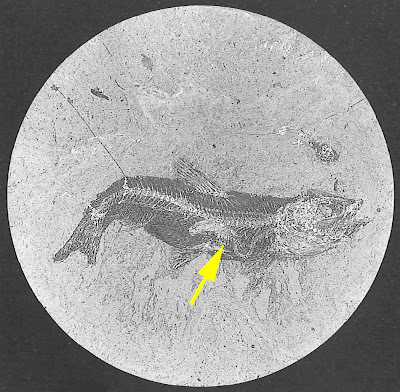 The name means “lucky fish from the Dunvegan Formation”. Well: Cequel Energy Inc, west-central Alberta. Comment: This is the only known specimen of this genus and species. It is the most complete fossil vertebrate ever found in a core. Aeduella sp. 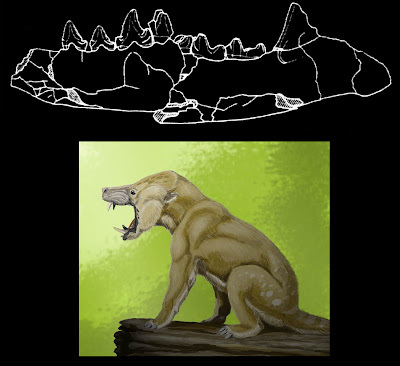 in core (left) and explanatory drawing of specimens (right). 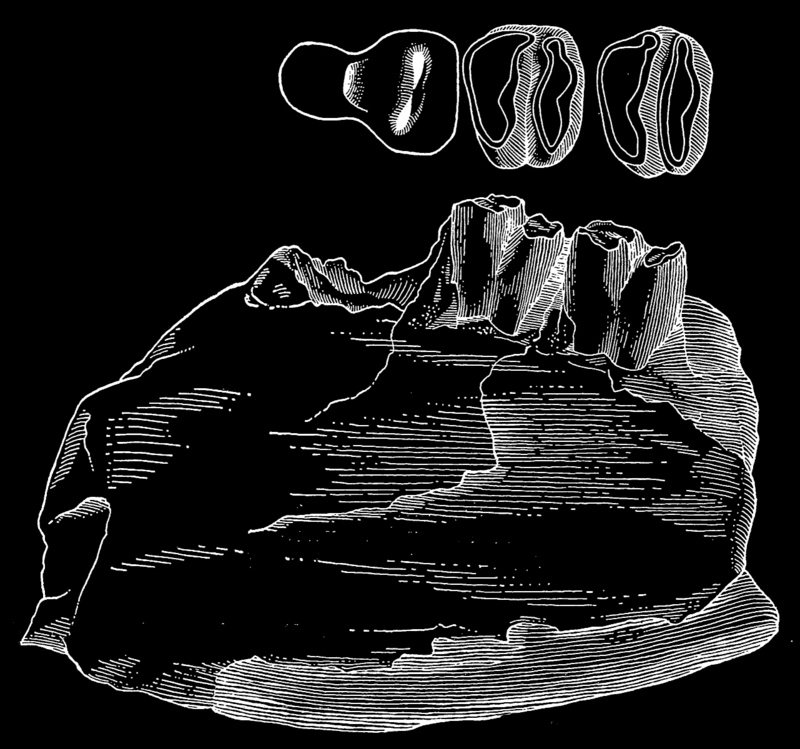 The jaw and teeth of Protohippus tehonensis in side and top view. 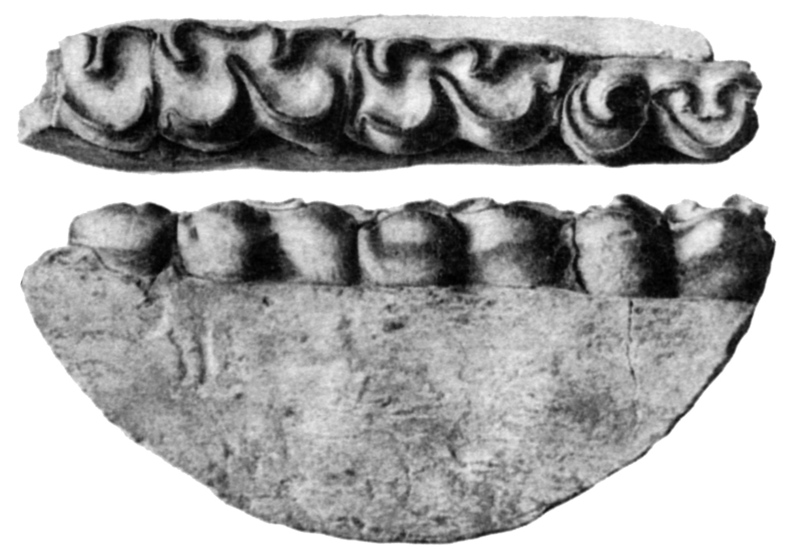 The curved margin of the jaw is the edge of the core. Catalog number: California Institute of Technology Vert. Paleo. 1825. Life restoration of a snake-like aistopod amphibian (left) and acanthodian (right). Material: Fish are known from isolated teeth, scales, and occasional skull bones. Amphibians are known from isolated vertebrae and teeth. Comment: This is the most diverse borehole vertebrate fauna reported to date in the scientific literature, containing numerous groups of fish as well as amphibians. The publication by Schultze is a brief preliminary one page report. Fish-In-A-Fish. Osmerid fish skeleton from core with smaller argentinoid fish (indicated by arrow) in stomach region. Material: Multiple fish skeletons from two wells. One contains a small fish skeleton inside its stomach region. Catalog number: Geological Museum, Copenhagen MGUH VP 2927, 3024 and other specimens with no reported numbers. Comment: This is the only vertebrate fossil from a borehole that has preserved stomach contents. The skeleton of Neolycoptera gracilis, skull at the right end. Material: Multiple fish skeletons from closely spaced wells. Catalog number: Museo de La Plata, MLP 40-XI-7-1 to 4 (L. patagonicus), MLP 39-6-30-10 to 12 (Bunoderma baini), MLP 39-6-10 1 and 2 (Neolycoptera gracilis). 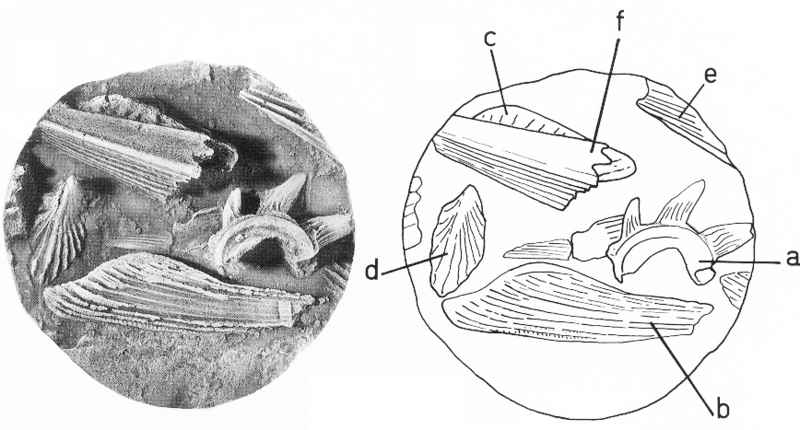 Comment: The fossils occurred at several levels (Neolycoptera gracilis from 6663 ft, Leptolepis patagonicus 24477-3281 feet, and depth unreported for Bunoderma baini). I have grouped them together here for convenience. Human finger points at cross section of Plateosaurus finger bone in core. Comment: This is the first dinosaur fossil from Norway. It was found in a drill core from an offshore drilling platform in the North Sea. Comment: This is the oldest fossil vertebrate known in the state of Florida. It is on permanent exhibit at the Florida Museum of Natural History. The scaly body of Cleithrolepis granulata as exposed in the core. Material: Several specimens, mostly of complete fish. Comment: These are the first and only known specimens of this species of fish. The anteroventral plate of Qataraspis (right) and its position (red) in a restored relative, Coccosteus. 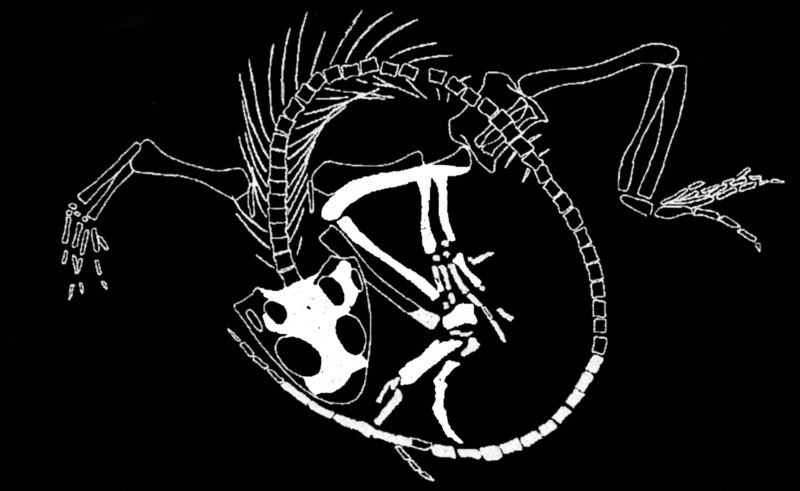 Comment: This is the deepest known occurrence of a fossil vertebrate. This specimen is the only one known for this genus and species. The species epithet deprofundis is Latin for “out of the depths.” How apt! In 1961 a group of prospectors, searching for copper, were drilling “somewhere in the forbidding Arctic tundra of Lapland”. The core sample brought up (from an unspecified depth) a chunk of leathery skin and bloody flesh. There were bones in the flesh, which the crew chief identified as fossilized. The material was ultimately sent to the Copenhagen Aquarium, as was a larger piece of tail found soon after. 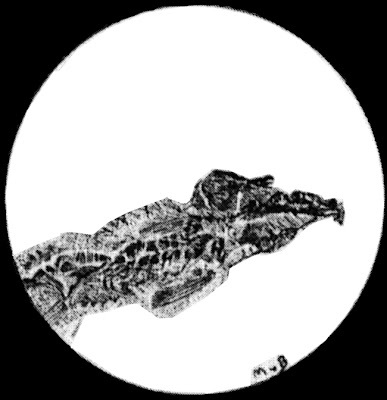 Ultimately the flesh reanimated and grew into the gigantic and fearsome Reptilicus, a dragon-like cross between a “Diplodocus and an amphibious form”. Reptilicus decimated much of Copenhagen and the Danish countryside before being destroyed. Well, only sort of destroyed. 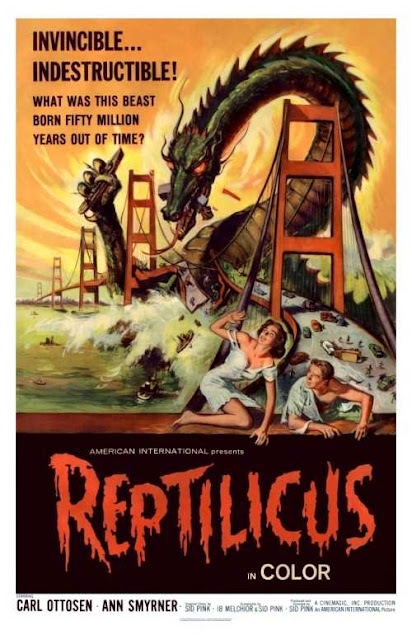 I am an unabashed fan of B-grade 1950 - early 1960’s, sci fi movies but Reptilicus is truly among the worse examples of that genre. Reptilicus is a poorly controlled and ridiculous marionette, with acid spit that is rendered in the cheapest and least believable way possible. I saw this movie when I was about 10 years old and I distinctly remember leaving the theater with the feeling that I had been ripped off by this awful piece of inexcusable dreck. It is a truly infamous piece of sci fi film making and I encourage you to try to track down a copy sometime. You will never forget it --- try as you might. 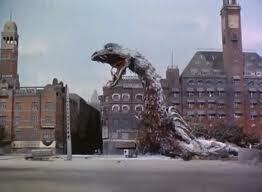 Oh, and yes, Reptilicus is the ONLY film monster ever to be discovered in a borehole core. My deep thanks to Hans-Peter Schultze, Carl Mehling, Adrianna Lopez-Arbarello, Paul Lambers, Emma Rainforth, Anne Warren, Andrea Tintori, Mike Bell, Gilles Cuny, Mikko K. Haaramo, Alberto Luis Cione, Alan Heward, John Hunter, Richard C. Hulbert Jr., Tommy Tyrberg, George Engelmann, Peter LeTourneau, and other colleagues who over the years have exchanged info about borehole paleontology on the VertPaleo and Dinosaur Mailing List discussion lists and exchanged pdfs or hard copies of publications. Dolgopol de Sáez, M. 1949. Noticias sobre peces fósiles argentinos. 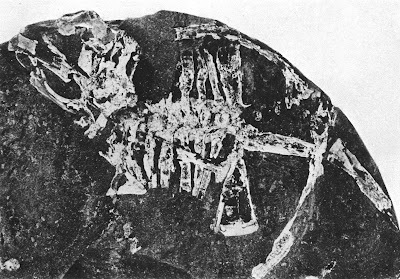 Revista del Museo de La Plata, Paleontología 14(96): 443-461. Fraser, N.C. and Benton, M.J. 1989. The Triassic reptiles Brachyrhinodon and Polysphenodon and the relationships of the sphenodontids. Zoological Journal of the Linnean Society 96:413-445. Hart, M.B., and Mountain, G.S. 1987. Ichthyolith evidence ofr the age of the reflector Au, Deep Sea Drilling Project Site 603. Deep Sea Drilling Project , Volume XCIII: 739-750. Hulburt, R.C. (ed.) 2001. The Fossil Vertebrates of Florida. University Press, Florida: 2350 pp. Hurum, J.H., Bergan, M., Müller, R., Nystuen, J.P. and Klein, N. 2006. A Late Triassic dinosaur bone, offshore Norway. Norwegian Journal of Geology 86: 117-123. King, M.J. and Benton, M.J. 1996. Dinosaurs in the Early and Mid Triassic? – The footprint evidence from Britain. Palaeogeography, Palaeoclimatology, Palaeoecology 122: 213-225. Thulborn, R.A. 1990. Dinosaur Tracks. Chapman and Hall, London: 410 pp. Wills, L.J. and Sarjeant, W.A.S. 1970. Fossil vertebrate and invertebrate tracks from boreholes through the Bunter series (Triassic) of Worcestershire. Mercian Geologist 3: 399-414. 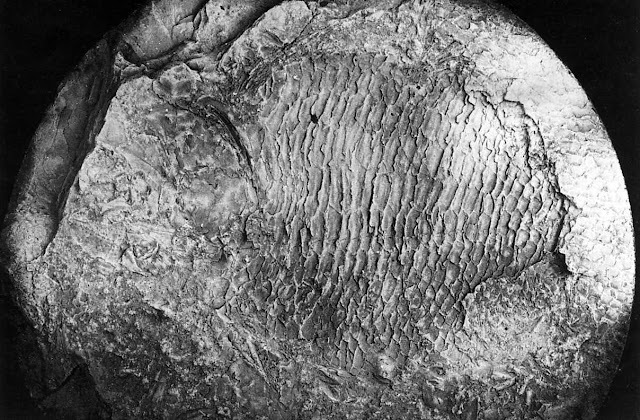 Acanthodian restoration: Creative Commons license.